Clear up those cords in the home, office or garage. Go from a jumble mess of cords to an organized look! Plugs and outlets and furniture never go together but with the Side Socket, you can now use them in harmony. Now all your furniture can be flushed against the wall. No more protruding outlets and plugs! 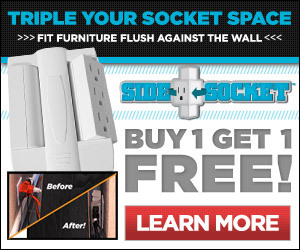 No only will it look better, but with the side socket, you turn those 2 outlets into 6 outlets! The swivel heads make them easy to reach without having to move your furniture. Buy 1 today and get another one for free! Click below to learn more!